Police in Spain have released details about a raid on an internet service provider suspected of hosting an illegal TV streaming business. Y Internet allegedly provided unauthorised online subscription services for pay-TV channels. 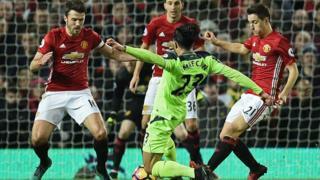 The investigation was initiated by the Premier League as part of a crackdown on illegal redistribution of its live football broadcasts. The ISP has not responded to requests for comment. According to police, the ISP, which was based in Malaga, allegedly sold subscriptions to pubs, hotels and individuals on the Costa del Sol. No-one was arrested in the raid, which happened in September, but equipment was seized and the investigation remains ongoing, according to the police. Two individuals believed to have run the ISP from the UK had been charged with "intellectual property-related offences", the BBC was told, but their names have not been released. Premier League director of legal services Kevin Plumb said: "The raids conducted by the Spanish authorities... are a positive example of law enforcement taking piracy and IP infringement seriously. "This approach is essential for organisations like the Premier League - and other creative industries - as our model is predicated on the ability to market and sell rights and protect intellectual property. "It is because of this that clubs can invest in star players and managers, and world class stadiums - the very things fans enjoy about our competition." The Spanish raid follows a recent case in the UK where an individual who supplied IPTV devices that showed Premier League football matches illegally was sent to prison for four years.